Well, it's been a few days since I last blogged. I've been a busy girl and really haven't had much time to craft. You see, my husband has been asking me over and over, "When are we going to have our garage sale"? I just keep flopping all over this way and that, saying (whining), "I don't knowwwwww. It's such hard work, whaaa whaa whaa..". (Ya'll get the picture, right?). So this past Monday, he just came home and said, "Hey, I took Friday off this week to have our Garage Sale." Well, alrighty then and so it was decided. So that's what I've been doing, hemming and hawing as to what to sell, getting the permit, change, signs, tags---aaaaaccckk! So because I'm me and LOVE to wait until the last minute for things (especially the bigger jobs), I spent from 10AM to 12:30AM Thursday in my garage, cleaning it out, sorting stuff, and getting all the tables ready. All by myself, thankyouverymuch. You can do the math, but it was like a 14 and a half hour workout. We had our sale yesterday and are continuing it today, but needless to say, every fiber of my being is sore, including my toes. Not to mention that I am now sick due to all the dust and dirt I stirred up and Claritin isn't touching my allergies. All I can say, is that we better do better today than yesterday, or I may start to think Garage Sales are not worth the effort! Anyway, here's my card for Jen's Sketch For You To Try today. I just couldn't stand it anymore and finally got my (old lady) Tea For Two set from Papertrey in the mail the other day. These leftover scraps and colors just jumped out at me and the teapot just looks so relaxing about now, that I figured it was a good choice for today. So I guess I better go push my wares for a little bit and then it's off to the Great American Scrapbook Show in Arlington with Jen. I hope my sore legs can take it. 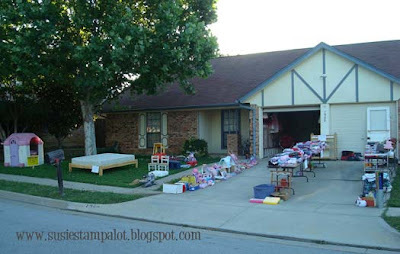 My tip for today contains some garage sale etiquette that you are to follow from here on out, so be sure and read on, my friends! Carole's out of town, so we're letting her off the hook this week. Ope, it's the first of the month, too and we have a new Guest Designer Star--Ashley Newell! Go Ashley! Check out her creation on Jen's blog, too! SUSIE Q-TIP: If it's marked a DOLLAR, NO, I AM NOT SELLING IT FOR FIFTY CENTS!! I LOVE to spend an entire day marking things as to what I'd like to get for them, only to get half or nothing! It's my favorite. I'm pretty sure I'll have someone today ask to pay half of something marked twenty-five cents. You do the math. IT'S A GARAGE SALE, PEOPLE--THE STUFF'S CHEAP ENOUGH ALREADY!! And there, they go, walking away from a Winnie the Pooh book for a quarter...not a good enough price. Seriously. I feel sorry for their kids. They probably have to play with toilet paper rolls because they came free with a 4-pack. Oh, but only after they peel the two-ply apart to make it go further, thus making the kids wait twice as long for the beloved cardboard roll. I can only imagine. Ok, I'm done now. Just had to get that off my chest. Thankyouverymuch. See anything you want? A few years ago, I decided to sell almost all things in a garage sale, wanting to set up a special foundation fund to send kids to space camp in honor of my brother's 50th birthday. He died very young but loved NASA. I had a dress brand new that was 175 bucks and marked it to 7.50. someone offered me 2. Another hardcover book still on the best seller list originally 30, had a dollar on it. was offered 10 cents. I dont live in a cheap area but found the people from my own town were so petty. I had screwed up my knee and could hardly walk. I finally got so angry after spending 6 weeks getting everything together, spending 65 dollars for an ad and had made signs with my intentions for the money-that I stood in my garage and told people to get out 9used the F word too) and never dirty my yard again. They thought I was joking and so I took a broom and started to sweep them out. I was so angry and in a lot of pain. I boxed everything up and took it to Goodwill. Never again. I am leaving whatever I have left in cash or assets to the local Food Bank and Humane Society upon my death. And I keep a box in my garage and when it's full, I take it to the Goodwill drop off. I don't need the cash that bad and would go without something before I ever did a garage sale again. I hope you have better luck. first, your cards is gorgeous...wowza...love, love, love all the color!!!!!! I HATE having garage sales! They are so not worth the effort. I just donate everything and take it off my taxes. I too will be at Great American Scrapbook Convention in Arlington later today! I am sooo looking forward to it! Hahaha!! Your entire entry had me laughing. Been there, done that! Your card is gorgeous. I just got that set last week and can't wait to ink it up. I may have to copy your pierced steam. It's so cute!! I agree! I don't know why they have to bargain with you! It IS cheap enough already! We just had a garage sale a few weeks ago. It took me 4 days to set it up, it is sooo much work, but I sold alot and it was worth it...but not again for a few more years! LOL - your post has me in stitches! I'm a first time visitor, but I will come back just to see what else happens in your part of the world! I, personally, hate garage sales. I hope you made a bundle from yours - it looks like you are super organized and have gobs of great stuff! Oops, Sorry! I completely forgot to tell you how adorable the card is!! 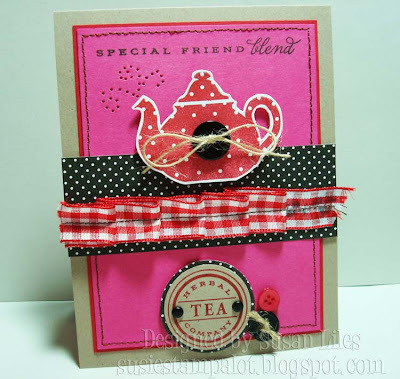 I love the bright pink and red together - and the tea pot is very cute! SNORT!! Glad you got that off your chest! LOVE your card...this set is on my watch list!! Oh for the love of cute, Sus! Love the spunky colors and of course, the black! The tea steam is pefecto! Deeeeee-licious! So full of such good stuff - the bold colors, the pleated ribbon, the buttons and twine. Good to the last drop! This is so cute! I love the color scheme and the fun gingham ribbon! Such a fun card! I was totally ROTFLMAO about your garage sale. We just had one this past saturday. It was the same thing. I have 25cents on a pair of Osh Kosh overalls I probably paid $25 for and they wanted to talk me down. Puleeease!! The volunteer group around the corner was collecting donations for the women's shelter so I donated all that didn't sell to them. What the shelter couldn't use was then given to other charities which sells to this place called Value Village. The Value Village will sell my overalls for about $5 and the same person who tried to talk me down will buy them for $5 and tell everyone what a bargain she got. Go figure!! Beautiful cards. I love checking out your blog and your creations! If you created nothing - I would still come over and over for humor alone! But all your creations are ALWAYS FANTABULOUS so I would be disappointed if you didn't create! I guess I want the eye candy and the laugh! LOL! I want the house, :). We just had a garage sale that went over very well, surprisingly. I had only one person ask for a markdown, and it wasn't terribly unreasonable. This is my first comment on your blog, but I check it frequently, love youre SusieQtips, and all your great inspirational ideas. Thanks! Your garage sale commentary cracked me up....it's so true!! I so agree with all your comments about the garage sale. It's such a frustrating experience in all...lots of time spent pricing, thinking out the organization of the tables, etc and then you get someone who just couldn't possibly pay a dollar for a set of mixing bowls. It doesn't matter what the item is they will always dicker down the price. I even had someone try to steal from my sale. I confronted her about it. Honestly it was over a total of .50. Truly sad!!!! Susan, your card is just adorable! I'm so lovin' that ribbon treatment! I'll have to admit it, but I'm one of those people you would hate to have at your garage sale! For years, I found ebay treasures at garage sales, and of course, the less I paid for my inventory, the greater my profit! I never price anything when I have a garage sale because my goal is to get the stuff out of my house. I love seeing someone's face when they leave with a bargain! You need to get the WHOLE street to have a garage sale next time. Then advertise a neighborhood garage sale...I bet you'd get WAY more people then!!! We had a TON-O-PEOPLE come down our little obscure street when our neighborhood got together like that. Well...Im sure Im not the only one who bargins at garage sales..but maybe the only one that will tell you...IT IS A GARAGE SALE....and you are selling it because you do NOT want it. I have had garage sales and I have shopped MANY garage sales. Im looking for a deal. You may feel it's a great deal and Im sure it is..but what would be a BETTER deal is if I could get it cheaper. Does that mean my COLLEGE age kids go without ...or Im so poor I cant afford to pay your dollar....? NO it means Im ALWAYS looking for a better deal. When you go to a car dealer and the prices have been slashed and the car you like is on sale, you mean to tell me you dont see if you can get it cheaper? If you say you NEVER bargin...then you have too much money. I have garage sales and I try to price things fairly, but if someone offers me less, I dont take it PERSONALLY .....I ask myself this: Do I really want to pack this up and store it again just to make an extra 50cents? 99% of the time my answer is SELL IT! Also, maybe the person asking is financially not able to afford some of the nicer things in life and maybe it took that lady a lot to ask for it cheaper. One time this lady was selling a purse she got for 50.00. I asked if she would take 15.00 instead of the 20.00 she was asking. She told me ...I GOT THIS PURSE AT Macy's on sale. I told her Im sure she did and Im sure even at 20.00 it's a good deal..but Im not shopping at Macy's ..Im shopping in your garage and Im buying a purse you used and no longer want. I think if people are gonig to be so offended because someone wants a better deal...then don't have garage sales....sell it on ebay then. I love your cards and your blog..thanks for sharing your time and talents with us.